Back to the subject of turkeys: real turkeys, this time, rather than bad science. In the days leading up to Christmas, as the country gradually shut down and real news dried up, so the newspapers filled their space with advice from celebrity chefs on how to roast the perfect turkey. Strip away all the suggestions to brine, baste, cover with foil and more, and most can be reduced to the very simple formula that I learnt from my mother: 20 minutes per pound, plus 20 minutes. Which, if you think about it, is basic algebra: y = mx + c, where y = cooking time, x = the weight of the bird and c, the constant = 20 minutes. I spend much of my working life battering data into forms that can be expressed as lines on graphs and, it seems, I cannot switch off, even when I cook the Christmas dinner. Any cook knows that this relationship is just a guideline, that the best way to determine when the bird is cooked is to pull it out of the oven and poke it with a fork or skewer. Given the shortcomings of oven thermostats, constant opening and closing of the oven door to put in vegetables as well as variations in the birds themselves, we cannot reduce cooking a turkey to a reductionist formula. That’s why I put the open circles onto my graph: to show that sometimes the bird is ready sooner, sometimes it takes much longer than we expect. At some point, the scientist in me has to stand back and let the inner craftsman take over to decide when the turkey is ready to carve. Back in June I talked about the philosopher William Wimsatt’s work to understand complex systems (“Ecology in an Age of Austerity“), suggesting that it was often better to collect several bit-size nuggets of information, rather than rely upon a single strand of evidence. My point back then related to ecology, suggesting that the effort spent refining existing approaches to assessment might be better spent looking at alternative sources of evidence. 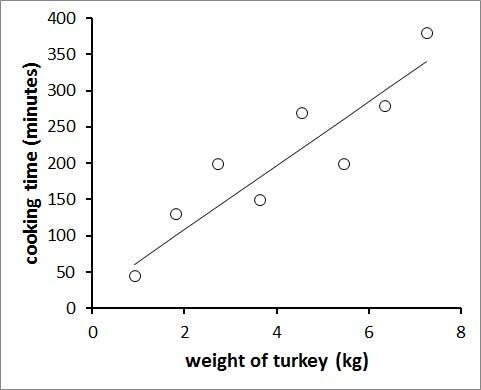 Cooking a turkey offers a fine example of just that: it may be possible to include more variables and produce a more precise formula for cooking a turkey. But would it be worth the effort? We can go only so far with predictive models before we will want to reach for a fork in search of corroboration. . The irony is that, pushing my analogy a little further, scientists make their reputations by innovation and a paper entitled A multivariate model for predicting temporal parameters in domestic poultry roasting will probably be accepted and published by a journal somewhere . Science will have advanced, albeit incrementally, even if no-one ever puts the elegant ideas developed in the paper into practice. Lesson #1 from 2013: just because it is in a peer-reviewed journal doesn’t mean that the ideas are superior to the status quo, especially when that draws upon an individual’s experience and wisdom.